Advanced Technical Concepts supplies a range of clamps that act as pipe, tube, hose and cable supports. These offer a solution to the widest possible scope of everyday applications from industrial hydraulics, offshore, mining industry, general industrial pipe construction, pneumatics to pipe, hose and cable installation. Clamps allow for quick and easy pipe and hose installations. They can also have vibration and noise reducing features. Basic clamp sizes are from 6mm – 500 mm in both imperial and metric ranges. Ranges include Standard, Heavy, Twin, Lightweight Construction & U-Bolts. 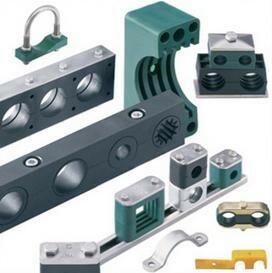 Clamp materials available are Polypropylene, Polyamide and Aluminium as standard. ATC offer other mechanical solutions including hydraulic and torque tools.